Milos Raonic was born on 27th December 1990, in Titograd, (then) SR Montenegro, SFR Yugoslavia, and is a Canadian professional tennis player, who is currently in the 3rd position on the ATP Tour rankings, having eight ATP titles to his name. Raonic has the record of 259–120 in singles, having reached the Wimbledon finals in 2016 and the semi-finals at the Australian Open the same year. His career started in 2008. Have you ever wondered how rich Milos Raonic is, as of early 2017? According to authoritative sources, it has been estimated that Raonic’s net worth is as high as $12 million, an amount earned through his successful pro tennis career. In addition to earning over $14 million in prize money, Raonic also has sponsorship deals with New Balance, Lacoste, Rolex, and Aviva, among others, which have also improved his wealth. 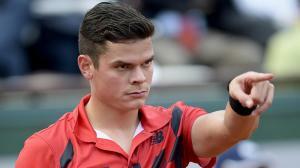 Milos Raonic is the son of Dušan, a PhD. in electrical engineering, and Vesna, who has degrees in mechanical and computer engineering. His family moved to Canada in 1994 and settled in Brampton, Ontario, where Milos grew up with his sister Jelena, and brother Momir. Raonic started playing tennis at the age of six, and he played his first match under the ITF in 2003. He spent the next five years as an amateur with the record of 53 wins and 30 losses in single, and 56-24 in doubles. Although accepting a scholarship from the University of Virginia, Milos decided to pursue his professional tennis career instead, so in 2008 he started playing on the ATP Tour. Between 2008 and 2010, Milos usually played at ITF Futures and ATP Challenger tournaments, winning his first ITF title in Montreal in 2009, followed by three more ITF titles in singles and five in doubles in the next two years, while in February 2011 he reached his first ATP finals and won in straight sets over the Spaniard Fernando Verdasco in San Jose, California, increasing his net worth to a large degree. Only a week later, Milos played in another final, but this time he lost to Andy Roddick at the US National Indoor Championships in Memphis, Tennessee. In 2012, the Canadian reached four more ATP finals; winning two of them – Chennai Open against Janko Tipsarevic, and then he defended his title at Pacific Coast Championships with a victory over Denis Istomin, adding a considerable amount to his net worth. In February 2013, Raonic won his third straight title at the Pacific Coast Championships, this time beating Tommy Haas, while the following September, Milos was victorious at Thailand Open, defeating Tomas Berdych in the final. Raonic’s first 500 Series win came in August 2014 at the Washington Open, when he beat compatriot Vasek Pospisil. He waited for more than a year until his next title, which came at St. Petersburg Open against the Portuguese Joao Sousa. Raonic’s latest title was in January 2016, when he defeated Roger Federer in straight sets at the Brisbane International, while he reached three more finals that year, including the Masters at Indian Wells and at Wimbledon, losing to Novak Djokovic and Andy Murray, respectively. Because of his height of 1.96m, Raonic is best known for his strong service, and has been compared to John Isner and Ivo Karlovic, who are among the best servers in the game in the last decade. He has changed many coaches in his career; some of them were Ivan Ljubičić, Carlos Moyá, and most recently, John McEnroe, and in the new 2017 season, Milos has started to work with Richard Krajicek. Regarding his personal life, Milos Raonic has been dating the Canadian fashion model Danielle Knudson since 2014; his current base is in Monte Carlo, Monaco. Milos is a big fan of FC Barcelona, the Toronto Maple Leafs, the Toronto Blue Jays and the Toronto Raptors. In 2012, he launched the Milos Raonic Foundation, which supports children from a disadvantaged background.